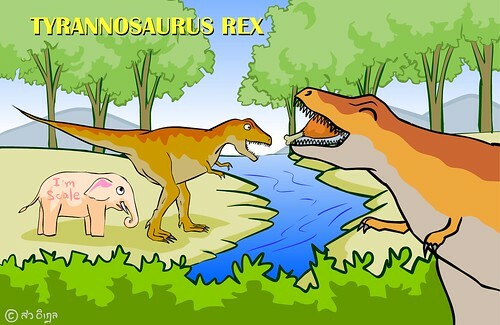 We had believed that T-Rex was the biggest carnivore dinosaur for a big while. Although currently Spinosaurus takes that prize, T-Rex is still the hero of children. T-Rex had a big skull comparing with its body. This means T-Rex could be one of the most intelligent dinosaur with a very fast instinct. A strange thing of T-Rex is its small arms. Its arms were just the size of human’s arm which might be useless with that massive body. Roll mouse over the big dinosaur, you will see it eat meats. This shows that T-Rex has a very fast instinct.